Most Beautifully Designed Mosques in Indonesia need to enter into the list of places you need to visit when you are on vacation in Indonesia.Some mosque buildings in Indonesia have a very grand architecture. When you visit some magnificent mosques in Indonesia, you can enjoy the beauty of mosque architecture. Most Beautifully Designed Mosques in Indonesia regionactually spread in various places in Indonesia. Some magnificent mosques will be found in Jakarta, Central Java, East Java, West Java, Samarinda, Aceh, and Indramayu. When talking about the grandest and most beautiful mosque in Indonesia, here is a list of mosques with the grandest building architecture. Dian Al Mahri Mosque in Depok is a mosque that has beautiful buildings with dome made of gold. The gold-plated dome consisted of one main dome and four small domes, while inside it hung a crystal lamp weighing 8 tons imported directly from Italy, and there were some reliefs in it also coated in gold. Al Akbar Mosque is a unique mosque with beautiful buildings in Surabaya. The unique character of the mosque lies in the unique but modern architectural design of the dome like a green-blue leaf. The mosque also has two floors with a lift and a tower with a height of 99 meters. From this tower, visitors can enjoy the view of three cities at once namely the city of Surabaya, Sidoarjo, and Bangkalan.The entrance is 45 main doors made of teak wood. In addition, in this mosque there is also a calligraphy ornament with a length of 180 meters and 1 meter wide. 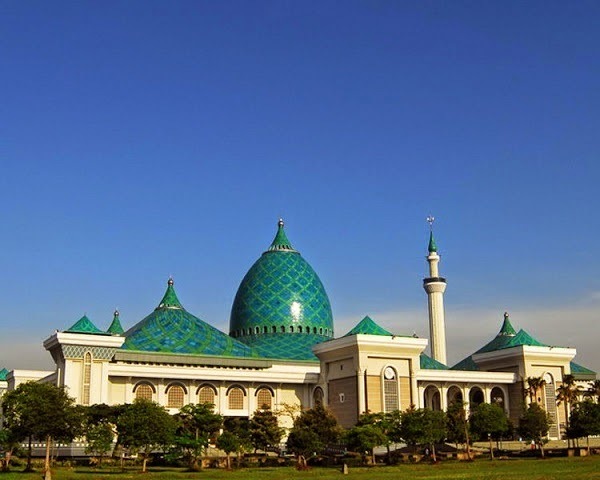 Islamic Center Mosque is a magnificent mosque in Samarinda with a very beautiful architectural building. The main building of the Islamic Center of Samarinda Mosque is about 43,500 square meters, has 7 towers with its main tower as high as 99 meters, and the outer wall of the tower is surrounded by AsmaulHusna. The construction of the tower at the Islamic Center of Samarinda Mosque is inspired from the tower of the Nabawi Mosque in Madinah, while its dome is inspired from the dome of the Haghia Sophia Mosque in Istanbul. Istiqlal Mosque is the largest mosque in Southeast Asia and one of the most beautiful mosques in Indonesia. This mosque building style embraces modern architecture with marble floors and walls adorned with geometric ornaments. While the main dome is 45 meters in diameter supported by 12 large poles, and the single tower has a height of about 96.99 meters. The mosque's main dome is famous for its unique characteristics of the Istiqlal Mosque. The most beautiful mosque in Indonesia is the Rahmatan Lil-Alamin Mosque in Indramayu, where the concept of Rahmatan Lil Alamin is reflected from the eight directions of the wind, from the shape of the mosque building and the number of small domes that surround the main dome. When viewed from any angle, whether from the north, south, west, or east, we do not know which is the front or the back of this mosque, because the shape of this building is very similar on each side. Try to visit the Most Beautifully Designed Mosques in Indonesia societyabove and you will definitely be able to enjoy your holiday better.There will be a lot of beauty in terms of building architecture that you can find in the 5 mosques above. Discover the beauty of mosque architecture in Indonesia by visiting the 5 mosques mentioned above.